The Far Shore DVD is about two surfing greats (Kevin Naughton and Craig Peterson) who in 1972 decided to travel around the world, visiting various surf hot spots from California, Africa, the pacific islands and even Europe. The DVD encompasses a decade of surfing that eventually leads the viewers into the early 1980's. This DVD documents their travels around the world as they discover secluded surf sports, all in the efforts of journalistic integrity for Surfer magazine. The Far Shore is a combination of modern day footage (interviews) with Naughton and Peterson that also incorporates the duos original super eight footage that makes you feel like you are watching an old family movie. 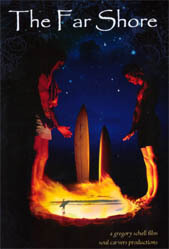 From tales of meeting strange people in remote distance places to deadly stories of sharks, this DVD is an enthralling documentary that I would recommend to all surfers that appreciate surfing history. As stated earlier, the video quality feels extremely reminiscent of watching family home movies because with super eight videos, there was only picture and no sound. The quality is extremely grainy but once the viewer starts to focus on the content of this disc such as the story of Naughton and Peterson, you will soon forget the below average video quality. The disc also incorporates recent footage of the surfing duo that goes hand in hand with the super eight footage. The audio quality of The Far Shore supports Dolby Digital and the dialogue is extremely clear and audible. The soundtrack of the DVD is brilliant (although nothing too modern), it helps take the viewer back in time to a place that was less hectic than today. The Fare Shore also contains a variety of extras that include Super Eight Scraps, a Making of the Film, Alternate Ending, Five Photos and the original trailer. Although nothing spectacular, it is still entertaining to watch and helps give another aspect on the adventures of Naughton and Peterson. I found The Far Shore a very compelling documentary about two surfers who would do anything for a perfect wave and a perfect photo. Match the documentary with some extremely mellow music and you have a great surfing documentary that shows what surfing was like over thirty years ago. Recommended to surfers of all ages!